Authored by: Nikole Brooks Bethea, P.E. Water on Earth is constantly moving in different forms. It is found in the clouds in the sky, waves in the ocean, flowing rivers and runoff streams, underground aquifers, and even frozen glaciers. This continuous movement on, above, and under the Earth's surface that transforms water into solid, liquid, and gas forms is known as the water cycle, a natural process that was not fully understood until the 19th century. 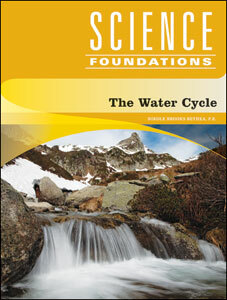 In The Water Cycle, read about how water moves through this cycle and how scientists came to understand it, as well as how treated wastewater is used to conserve our dwindling freshwater resources. Full-color photographs and illustrations. Sidebars. Further reading. Web sites. References. Glossary. Index. Nikole Brooks Bethea, P.E., is a professional engineer licensed in Florida, Georgia, and Alabama. She has 15 years of engineering experience, including the design of municipal drinking water and wastewater systems and environmental site assessments. Bethea received her bachelor's and master's degrees in environmental engineering from the University of Florida.